Mia is in her final year of high school, and has a promising career as a cello player ahead of her. She just nailed her audition for Julliard, and she’s dating the lead singer of an up and coming band. But when an impromptu road trip with her family on a snow day results in a horrifying car accident, Mia’s life will never be the same. After the accident, Mia wakes up standing over the wreckage, while the paramedics take her damaged body to the hospital. Her music loving parents are found dead at the scene, and Mia is in grave condition. As Mia’s remaining family members visit her in the hospital, she realizes that she has a choice to make. How can she live in a world without her parents? But how can she leave her boyfriend and her best friend? Over twenty-four hours in the hospital, Mia has to grapple with the biggest decision of her life: whether to end it or keep on living. This book was recommended to me over and over, but all the same I still had misgivings before I started reading. The quote at the top of the book from USA Today recommending If I Stay to fans of Twilight didn’t help. Twilight isn’t really my thing, so the comparison made me nervous. I started this book to kill time, but I ended up falling in love with it very quickly. As for the Twilight comparison, these two books have very little in common. If I Stay was similar to Before I Fall, not just because of the plot but also because of the writing styles. However, both can stand on their own and were similar without it feeling repetitive. Initially, I didn’t quite understand what this book was about. Soon, Mia is in a fatal car accident, and watches over her comatose self as she tries to decide whether she should live or not. Forman’s writing was quite lovely, and I loved the role music played in the novel. Initially, I wondered how the whole novel could focus on Mia making a single decision. I worried that it would drag on. Flashbacks are shown throughout the novel, and they helped with the pacing and kept the book from feeling dull. While I wouldn’t go as far to call the story heart wrenching, it was an emotional read. There were sections that certainly were tearjerkers, such as the end. Adam and Kim were incredibly realistic characters, and I also loved Mia’s family. I did like Mia as a protagonist, although she acted differently around other characters than you would expect from her narration. Like Adam, I loved her passion for music, but I found her to be a bit too perfect, and not as strong as some of the secondary characters. 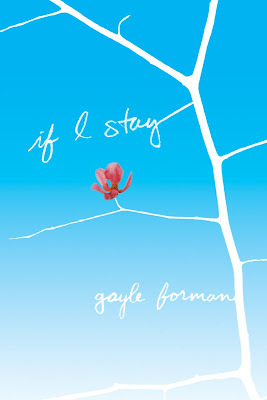 I was actually surprised to learn that there is a follow up to If I Stay, since I thought this was a stand-alone type of book. All the same, I am looking forward to reading the sequel. With most books, I love to read other reviews right after I finish, to hear what other people think. With If I Stay, I had no desire to read what other people had to say, since I just didn’t want to hear anything negative about this compelling novel, which was a first for me. Although If I Stay wasn’t perfect, reading it was a very personal experience and I would definitely recommend it.